Rhizophora spp. in Papua New Guinea. In the absence of hurricanes and chain saws, individual trees may reach 40m or more. Photo courtesy of Barry Clough. 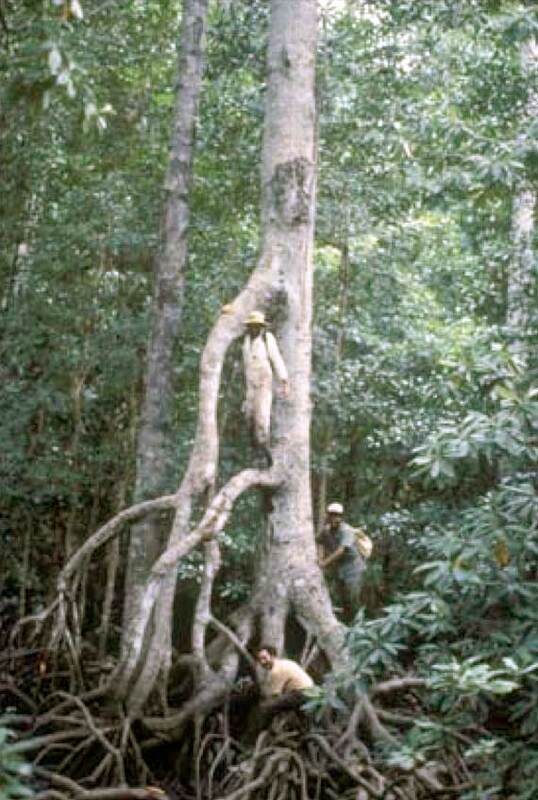 The genus Rhizophora contains more species of mangrove than any other. Their tangled prop root systems – illustrated in the header photo – are the “trademark” associated with all mangroves by most people (if they have heard of them at all). In the equatorial zones of New Guinea and Darien Province (Panama) individual trees may reach heights of 40 m. More generally, they are much shorter, and on some off-shore, eXtremely oligotrophic, peat-based islands, 50+ year old trees may be no more than a meter tall. The genus is thought to have originally evolved at the eastern, Indo-Pacific, end of the Tethys Sea. American, west African and eastern Pacific species evolved following dispersal westward before the Mediterranean closed off.1 The Rhizophora fossil record begins with pollen in Australia 60 MYA; by 40 MYA, fossil evidence shows expansion to North America, Panama, south-west Australia, India and Borneo. See the Mangroves page for more discussion of evolution. Today, there are 6 recognized Rhizophora species and 4 hybrids. Transcriptomic or genomic resources are available for R. mangle 2, R. apiculata (in press), R. mucronata (no publications) and R. stylosa (240 ESTs). Unfortunately, none of these has been extended to comparative transcriptomics and the network analyses that can give the most state-of-the-art indications of the links between the genome and organismal behavior. These will require in depth analysis of different treatments or conditions and will undoubtedly – or at least, hopefully – be available in due time. Can genomic/transcriptomic tools be used to answer physiological and ecological questions? Once comparative transcriptomic and network analysis tools have been developed, the number of addressable questions will approach the infinite. Some are immediately of practical interest. For example, how different are the organizations and details genomes of the Rhizophora species? Are they sufficiently similar that the genome of, say, R. apiculata can be used to study transcriptome expression patterns in R. stylosa? So far, the answer looks like it might be “yes”. Has the water-borne propagule dispersal mechanism resulted in sufficiently low variability in gene sequences that multiple individual samples can be pooled in transcriptome studies? As noted on the general mangrove page, much or most of the recent work on Rhizophora has originated in the lab of Suhua Shi (Sun Yat-Sen University, Guangzhou, China). They have particularly addressed a number of aspects of Rhizophora evolution showing that the genus is particularly appropriate for exploring biogeography, molecular evolution, population genetics, hybridization and conservation genetics. Chen et al. 9, for example, developed a suite of nuclear gene primers which showed applicability across five Rhizophora species. They applied those to populations in the Hainan (China) area for (a) reconstruction of Rhizophoracean phylogeny, (b) examination of the structure of Rhizophora genomes, and (c) identification of natural hybridization in the genus. The first application supported the hypothesis that the established migration of Rhizophora to the proto-Atlantic was, in fact, unsuccessful, and that the region was re-colonized from the IWP region approximately 12.7 MYA in spite of the closure of the Mediterranean at 18 MYA. Examination of the genome structures in four natural populations of R. apiculata (topic b) revealed extremely low genetic diversity but a strong influence of recent glaciations on the population dynamics of R. apiculata. Finally, they were able to verify that a morphologically intermediate individual between R. apiculata and R. stylosa was, in fact, a hybrid. In a more recent paper from the same lab, Xu, He et al.10 considered convergence at the gene level that might be expected in association with phenotypic convergence to the mangrove habitat. That study has been highlighted elsewhere on this site. Most recently, the Shi group has compared the transcriptomes of four rhizophoracean species (Bruguiera gymnorhiza, Kandelia obovata, Rhizophora apiculata, and Ceriops tagal), and Carallia brachiata, a terrestrial member of the family. 11 The transcriptome profiles were similar among the five species – a potentially very useful finding in itself – but genomic characteristics conserved across the four mangrove species differed from those of Ca. brachiata. Using an approach similar to that they employed with the mangrove fern, Acrostichum aureum12, they used these resources to consider the origin and evolution of the Rhizophoraceae, identifying 10 positively selected genes from the ancestor branch of the family, mainly associated with GO biological processes of stress response (a very broad and potentially meaningless class), embryo development, and regulation of gene expression (also perhaps too broad a classification to really be useful). Positive selection of these genes may have been crucial to the adaptation of the trees to stressful intertidal environments. The following list was generated by searching PubMed, limiting the list to 100 references. As there are many journals not indexed there, this list will be incomplete. Bajay, SK, Cruz, MV, da Silva, CC, Murad, NF, Brandão, MM, de Souza, AP et al. (2018) Extremophiles as a Model of a Natural Ecosystem: Transcriptional Coordination of Genes Reveals Distinct Selective Responses of Plants Under Climate Change Scenarios. Front Plant Sci 9:1376. doi: 10.3389/fpls.2018.01376. PubMed PMID:30283484 PubMed Central PMC6156123. Wang, Y, Liang, W, Tang, T (2018) Constant conflict between Gypsy LTR retrotransposons and CHH methylation within a stress-adapted mangrove genome. New Phytol. 220:922-935. doi: 10.1111/nph.15209. PubMed PMID:29762876 . Kennedy, JP, Pil, MW, Proffitt, CE, Boeger, WA, Stanford, AM, Devlin, DJ et al. (2016) Postglacial expansion pathways of red mangrove, Rhizophora mangle, in the Caribbean Basin and Florida. Am. J. Bot. 103:260-76. doi: 10.3732/ajb.1500183. PubMed PMID:26838364 . Gharat, SA, Shaw, BP (2015) Novel and conserved miRNAs in the halophyte Suaeda maritima identified by deep sequencing and computational predictions using the ESTs of two mangrove plants. BMC Plant Biol. 15:301. doi: 10.1186/s12870-015-0682-3. PubMed PMID:26714456 PubMed Central PMC4696257. Chen, Y, Hou, Y, Guo, Z, Wang, W, Zhong, C, Zhou, R et al. (2015) Applications of Multiple Nuclear Genes to the Molecular Phylogeny, Population Genetics and Hybrid Identification in the Mangrove Genus Rhizophora. PLoS ONE 10:e0145058. doi: 10.1371/journal.pone.0145058. PubMed PMID:26674070 PubMed Central PMC4682636. Wee, AK, Takayama, K, Chua, JL, Asakawa, T, Meenakshisundaram, SH, Onrizal, et al. (2015) Genetic differentiation and phylogeography of partially sympatric species complex Rhizophora mucronata Lam. and R. stylosa Griff. using SSR markers. BMC Evol. Biol. 15:57. doi: 10.1186/s12862-015-0331-3. PubMed PMID:25888261 PubMed Central PMC4389924. Lo, EY, Duke, NC, Sun, M (2014) Phylogeographic pattern of Rhizophora (Rhizophoraceae) reveals the importance of both vicariance and long-distance oceanic dispersal to modern mangrove distribution. BMC Evol. Biol. 14:83. doi: 10.1186/1471-2148-14-83. PubMed PMID:24742016 PubMed Central PMC4021169. Sandoval-Castro, E, Dodd, RS, Riosmena-Rodríguez, R, Enríquez-Paredes, LM, Tovilla-Hernández, C, López-Vivas, JM et al. (2014) Post-glacial expansion and population genetic divergence of mangrove species Avicennia germinans (L.) Stearn and Rhizophora mangle L. along the Mexican coast. PLoS ONE 9:e93358. doi: 10.1371/journal.pone.0093358. PubMed PMID:24699389 PubMed Central PMC3974753. Sahebi, M, Hanafi, MM, Abdullah, SN, Rafii, MY, Azizi, P, Nejat, N et al. (2014) Isolation and expression analysis of novel silicon absorption gene from roots of mangrove (Rhizophora apiculata) via suppression subtractive hybridization. Biomed Res Int 2014:971985. doi: 10.1155/2014/971985. PubMed PMID:24516858 PubMed Central PMC3910099. Gurudeeban, S, Satyavani, K, Ramanathan, T (2013) Phylogeny of Indian rhizophoraceae based on the molecular data from chloroplast tRNA(LEU)UAA intergenic sequences. Pak. J. Biol. Sci. 16:1130-7. . PubMed PMID:24506012 . Yahya, AF, Hyun, JO, Lee, JH, Kim, YY, Lee, KM, Hong, KN et al. (2014) Genetic variation and population genetic structure of Rhizophora apiculata (Rhizophoraceae) in the Greater Sunda Islands, Indonesia using microsatellite markers. J. Plant Res. 127:287-97. doi: 10.1007/s10265-013-0613-z. PubMed PMID:24323307 . Takayama, K, Tamura, M, Tateishi, Y, Webb, EL, Kajita, T (2013) Strong genetic structure over the American continents and transoceanic dispersal in the mangrove genus Rhizophora (Rhizophoraceae) revealed by broad-scale nuclear and chloroplast DNA analysis. Am. J. Bot. 100:1191-201. doi: 10.3732/ajb.1200567. PubMed PMID:23711904 . Cerón-Souza, I, Bermingham, E, McMillan, WO, Jones, FA (2012) Comparative genetic structure of two mangrove species in Caribbean and Pacific estuaries of Panama. BMC Evol. Biol. 12:205. doi: 10.1186/1471-2148-12-205. PubMed PMID:23078287 PubMed Central PMC3543234. Pil, MW, Boeger, MR, Muschner, VC, Pie, MR, Ostrensky, A, Boeger, WA et al. (2011) Postglacial north-south expansion of populations of Rhizophora mangle (Rhizophoraceae) along the Brazilian coast revealed by microsatellite analysis. Am. J. Bot. 98:1031-9. doi: 10.3732/ajb.1000392. PubMed PMID:21653512 . Dassanayake, M, Haas, JS, Bohnert, HJ, Cheeseman, JM (2009) Shedding light on an extremophile lifestyle through transcriptomics. New Phytol. 183:764-75. doi: 10.1111/j.1469-8137.2009.02913.x. PubMed PMID:19549131 . Mukherjee, AK, Acharya, L, Panda, PC, Mohapatra, T, Das, P Genomic relations among two non-mangrove and nine mangrove species of Indian Rhizophoraceae. Z. Naturforsch., C, J. Biosci. 59:572-8. . PubMed PMID:15813382 . Parani, M, Rajesh, K, Lakshmi, M, Parducci, L, Szmidt, AE, Parida, A et al. (2001) Species identification in seven small millet species using polymerase chain reaction-restriction fragment length polymorphism of trnS-psbC gene region. Genome 44:495-9. . PubMed PMID:11444709 . Pearse IS, Heath KD, Cheeseman JM. Biochemical and ecological characterization of two peroxidase isoenzymes from the mangrove, Rhizophora mangle. Plant Cell Environ. 2005;28:612-622.